There had been speculation about the group's future, after the 34-year-old singer decided to pull out of the Big Reunion tour for "personal reasons". But Abz (Richard Breen), who took part in last year's series of Celebrity Big Brother, told the Daily Star: "I've definitely not left. All is gravy with me and the boys. "We are still together. Five aren't splitting up. We are supporting McBusted on tour and also have plans for next year," he added. Sean Conlon, Ritchie Neville and Scott Robinson will continue with the Big Reunion tour as a trio, alongside Blue, 911, Damage, 5th Story, 3T and A1, from October. 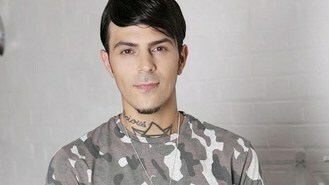 Five announced the news on Twitter on March 20, saying: "Unfortunately Abz is unable to make The Big Reunion Tour. But don't worry he's not leaving the band!" The band continued: "Abz is still confirmed for all other Five shows coming up! We had to make a decision whether to go forward for the tour as a three - we didn't want to let the fans down or The Big Reunion down as this is where the journey restarted for us and we thank you guys for all your ongoing support."